If you are aged between 14 and 18 and interested in pursuing further studies in Art and Design, our weekly art and design programmes will provide you with a broad introduction to the subject. 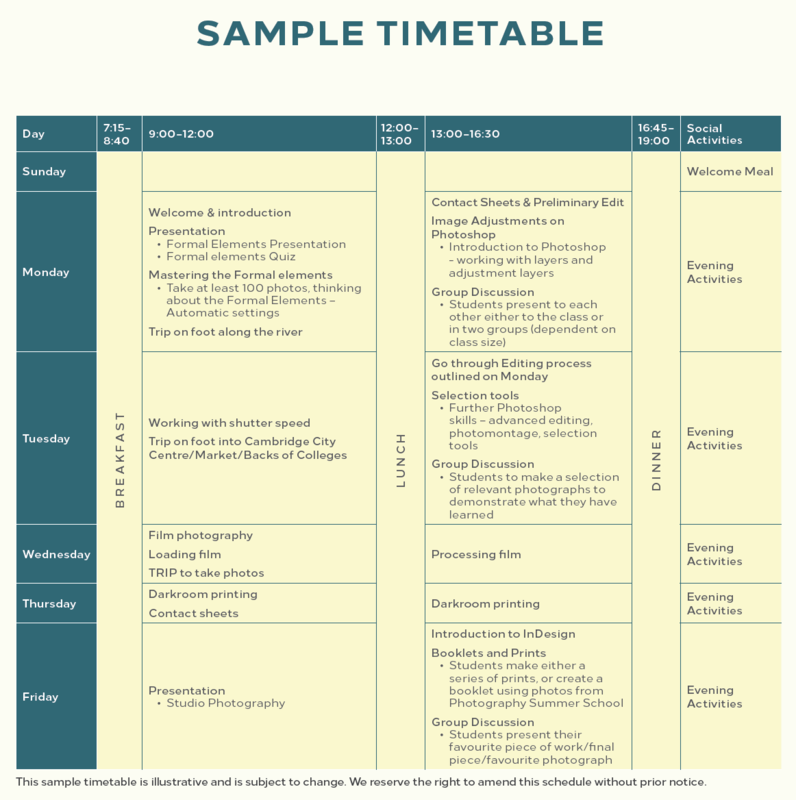 Weekly programmes are available in Photography, Painting & Drawing, Graphics & Illustration, Fashion Promotion and 3D Design. No English lessons included - international students will require a good level of English. 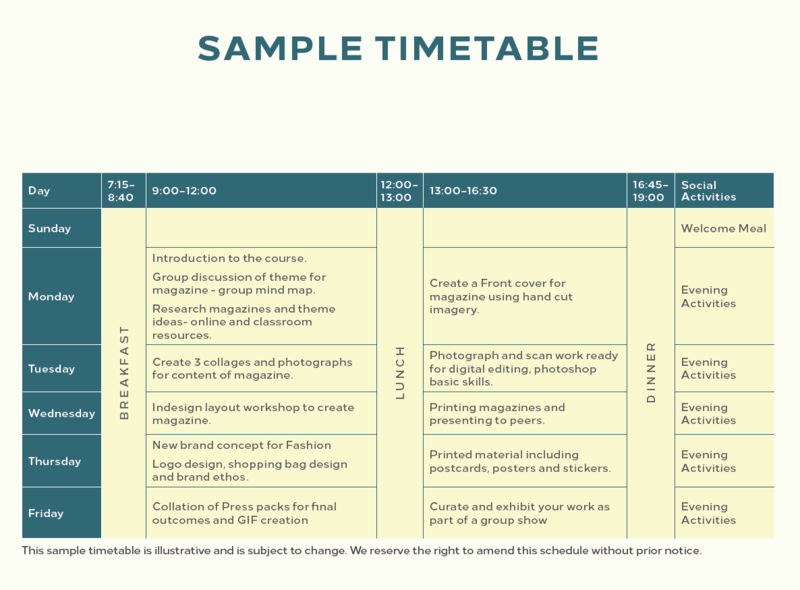 This course is designed to provide you with a broad working knowledge of a range of specialist disciplines within art and design. It is ideal for students serious about pursuing further studies or a career in art and design. 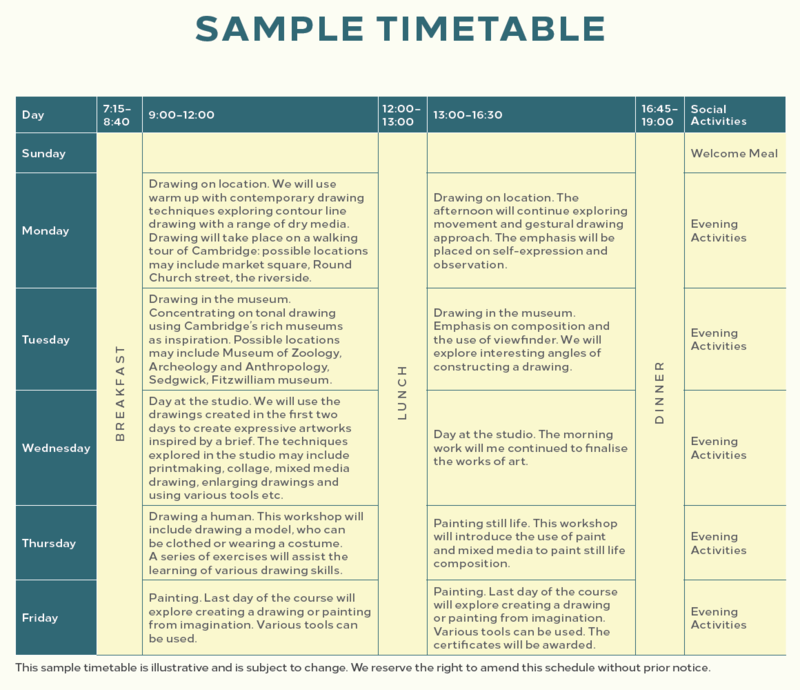 With direction from professional artists, classes are intensive and students are encouraged to produce a high standard of work in a different specialist area each week. International students should have at least an intermediate level of English and can choose to combine their specialist weeks with separate weeks of Intensive English. YOU WILL USE CAMBRIDGE AS YOUR INSPIRATION TO CREATE AN IMAGE PORTFOLIO. YOU WILL LEARN HOW TO USE DIFFERENT CAMERAS AND SETTINGS FOR THE BEST EFFECT. DURING THE DIGITAL PHOTOGRAPHY COMPONENT YOU WILL LEARN TO MANIPULATE AND PRINT DIGITAL IMAGES ON A COMPUTER BEFORE PRINTING ELECTRONICALLY. Our lecturers are all working professionals who will bring valuable industry experience to the programme. During the film photography component you will learn all about taking and developing your own photographs from initial concept to printed image, including wet processes to develop film in black & white in the darkroom. If you have your own digital SLR or traditional film SLR camera, please bring it with you. 1. Youill be able to take and develop your own black and white photographs from initial concept to printed image. 2. You will be able to use black and white wet processes in the darkroom. 3. The course will give confidence in using a SLR camera and understand lenses and techniques. 4. You be introduced to studio practice and lighting. USING WIDE RANGE OF MARK MAKING TECHNIQUES IN DIFFERENT MATERIALS YOU WILL EXPLORE CONTEMPORARY PAINTING AND DRAWING USING CAMBRIDGE AS YOUR INSPIRATION AND BEING GUIDED BY YOUR EXPERT TUTOR. YOU WILL VISIT A LOCAL GALLERY AND BUILD YOUR SKILLS TO INCLUDE A WIDE RANGE OF CONTEXTUAL PERSPECTIVE AND CREATE A STRONG BODY OF VISUALLY INTERESTING WORKS. This programme will give you the chance to study in central Cambridge in a fun and creative environment led by experienced tutors at CSVPA. Drawing is the basis for any creative art. This course is ideal for those that want to pursue careers in fine art and illustration. It also provides a foundation for different creative disciplines including graphics, fashion, 3D and Animation. The activities on this course help you to think creatively and challenge your mind set and approach to artistic problems. You will also have the opportunity to visit galleries and museums and gather research to inform your own responses. 1. You will gain inspiration from visiting world-class Cambridge museums and galleries. 2. You will develop your understanding through experimentation with a multitude of painting and drawing techniques. FASHION COMMUNICATION IS A MULTI-SKILLED CREATIVE DISCIPLINE. THROUGH FASHION ILLUSTRATION, DIGITAL SKILLS, BRAND DEVELOPMENT AND CREATIVE MANUAL WE WILL INTRODUCE YOU TO THE KEY AREAS OF VISUAL COMMUNICATION WITHIN THE FASHION INDUSTRY. ALL WORKSHOPS WILL BE CAREFULLY PLANNED TO TEACH SKILLS NEEDED TO BUILD A KNOWLEDGE THAT EQUIPS YOU FOR FURTHER EDUCATION IN FASHION COMMUNICATION. 1. You will develop an understanding of brand concept and the world of fashion communication. 2. You will gain a broad understanding of magazine layouts in the fashion media industry. 3. You will develop a basic understanding of logo design. THIS NEW ONE-WEEK 3D DESIGN COURSE WILL GIVE YOU THE OPPORTUNITY TO EXPLORE DIFFERENT ICONIC MATERIALS USED IN PRODUCT DESIGN, RESEARCHING THEIR PROPERTIES AND USES THROUGHOUT HISTORY. YOU WILL BE INTRODUCED TO DRAWING TECHNIQUES, 3D MAKING SKILLS AS WELL AS PRODUCT PHOTOGRAPHY ALLOWING YOU TO EXPLORE THE PRODUCT DESIGN PROCESS FROM CONCEPT DEVELOPMENT THROUGH TO DESIGN. 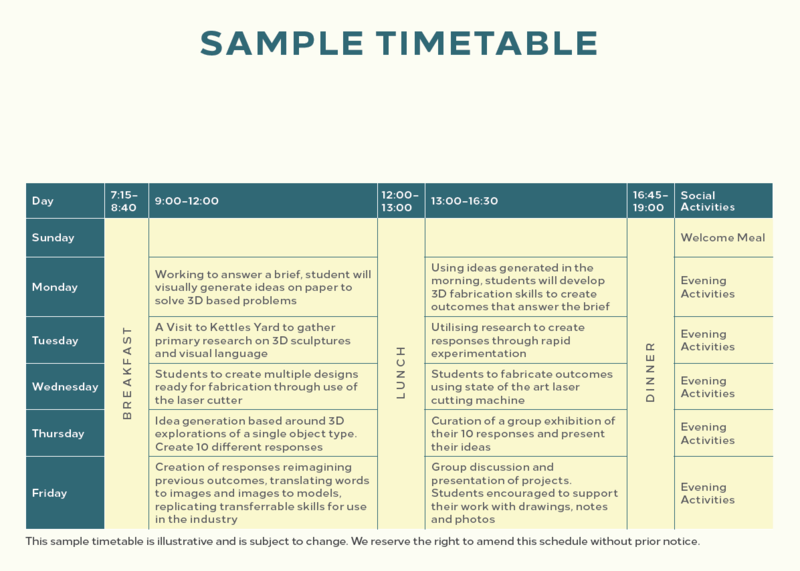 ACCESS WILL BE GIVEN TO THE COLLEGE’S WORKSHOPS GIVING YOU THE OPPORTUNITY TO EXPERIMENT AND INVESTIGATE MATERIALS BEFORE CREATING YOUR 3D PRODUCT. Exploring idea generation through material investigation and fabricating processes, you will gain an understanding of the basic skills required for a wide range of 3D design disciplines. Through experimentation and quick fire responses to the brief, you will start to understand the idea behind key 3D Design principles, including scale, abstraction, material, structure, form movement and colour and their place within wider design pathways. 1. You will, through problem solving, create 10 outcomes answering the brief based around redesigning a single object. 2. You will utilise state of the art laser cutting technology to prototype conceptual ideas. 3. Project will culminate in a group presentation of outcomes that peers will be able to discuss new ideas and skills developed over the week’s activities. THIS NEW AND EXCITING ONE-WEEK COURSE IS IDEAL FOR ANY BUDDING ANIMATOR STARTING OUT WHO WANTS TO DEVELOP THEIR TRADITIONAL AND DIGITAL TECHNIQUES USED IN COMPUTER ANIMATION. OVER THE COURSE OF THE WEEK, YOU WILL UNDERSTAND THE FUNDAMENTAL PRINCIPLES OF CHARACTER DESIGN, LAYOUT AND STORY BOARDING. USING 2D AND 3D CHARACTER ANIMATION, TOGETHER WITH EDITING CONVENTIONS YOU WILL LEARN HOW TO PRODUCED ANIMATED SEQUENCES AND STORIES CULMINATING IN THE CREATION OF A SHORT ANIMATED FILM. 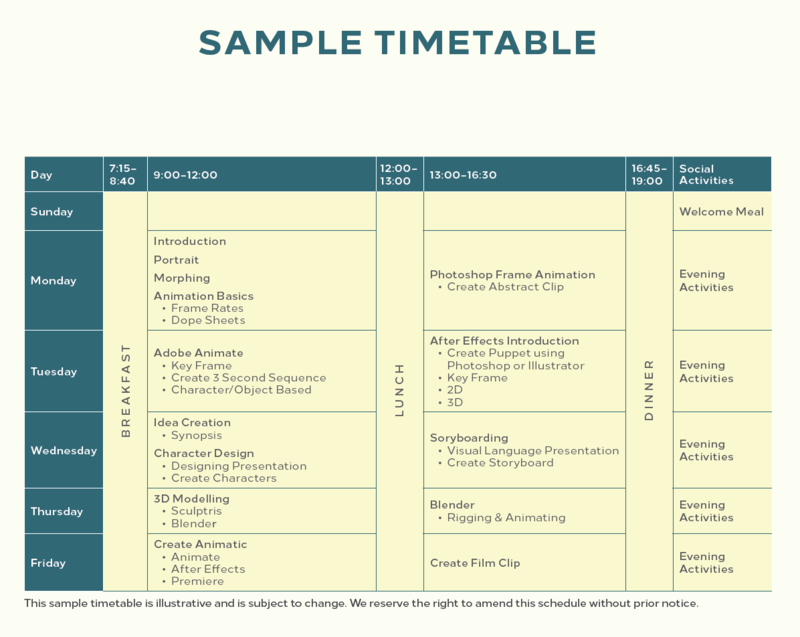 Through workshops, group projects and practical tasks, you will become acquainted with the skills and knowledge that will serve as a perfect starting point for future education and possible careers in the animation industry. Throughout the course you will become familiar with storyboarding, 3D modelling, sculpting, animation and rigging along with relevant software such as Photoshop, Illustrator, After Effects, Premiere Pro, Animate, ZBrush and Blender. Field trips will form a fundamental part of the course and students will go on one excursion to see a . 1. You will learn how to construct narrative using storyboard and character design techniques. 2. You will explore how to make an animated sequence using the latest Adobe software. 3. You will be introduced to 3D modelling using Sculptris and/or Blender. AIMED AT INDIVIDUALS WHO LIVE FOR GAMES, THIS CREATIVELY AND TECHNICALLY DEMANDING ONE-WEEK COURSE EXPLORES THE CREATIVE POSSIBILITIES IN DEVELOPING YOUR OWN GAME. USING A RANGE OF SOFTWARE PACKAGES TO CREATE 3D CHARACTERS AND BACKGROUNDS YOU WILL LEARN HOW TO DEVELOP GAME NARRATIVES, CHARACTERS AND PLOTS. YOU WILL BEGIN TO THINK AND WORK LIKE A GAMES DESIGNER, UNDERSTANDING HOW TO CREATE GAME CHALLENGES, RULES AND LOGIC. IT WILL GIVE YOU AN IMPORTANT FIRST STEP INTO UNDERSTANDING THE GAMES INDUSTRY AND IDEAL FOR STUDENTS WHO ARE THINKING ABOUT FUTURE DEVELOPMENT OF THEIR IDEAS INTO A MORE SUBSTANTIAL PIECE OF WORK. 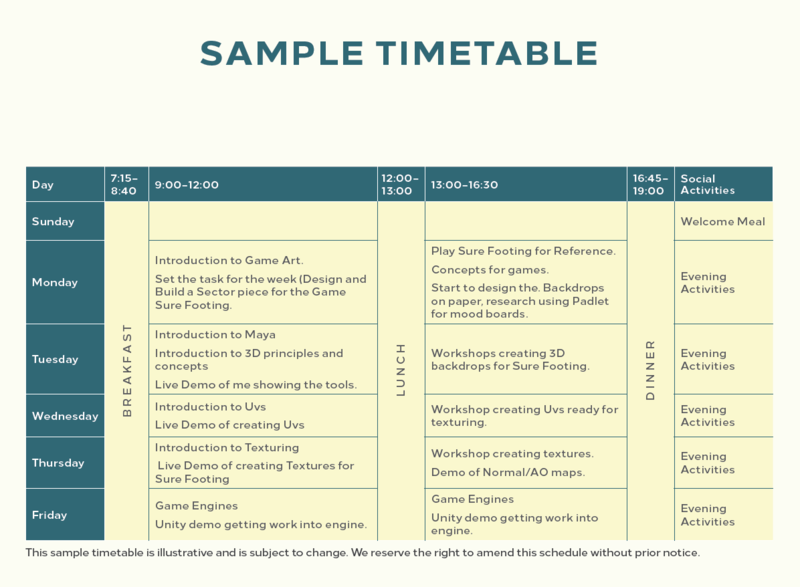 Throughout the week, you will learn how to design and build a sector piece for a game, start to design the backdrops on paper and research using Padlet for mood boards You will also gain an understanding of concepts for games, game engines and will receive an introduction to texturing. 1. You will have explored a range of practical concepts in creating a sector piece for a game. 2. You will have had the opportunity to solve creative briefs through a range of techniques and skills guided by our highly experienced staff. 3. You will have a basic understanding of game engines. 4. You will be able to create basic texturing.